When friends and motorbike enthusiasts Richard Stark and John Bowman couldn’t find leather riding gear they liked, they set out to make their own. Leonard Kamhout, a sterling silver jeweller, joined them and the rest, as they say, is history. How did this iconic eyewear brand get its name? Turns out their first job was costume designing for a film. Stark liked the working title of the movie and Chrome Hearts was born. Today, the label is headed by Richard and his wife Laurie Lynn Stark and, more recently, their eldest daughter Jesse Jo Stark. Even though they now have 28 stores around the world, Chrome Hearts still meticulously handcrafts each piece from their factory in LA. Located right in the heart of Hollywood, Chrome Hearts eyewear is decidedly all-American. In a world of mass production and fast fashion, you’ll be surprised to know that each pair of Chrome Hearts eyewear is a two-year labour of love. 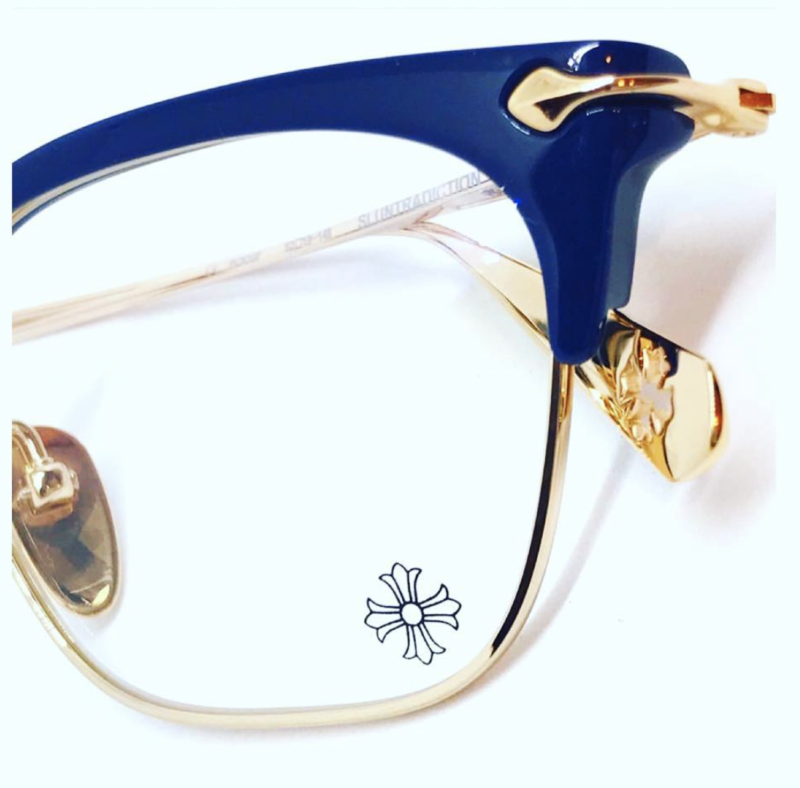 The titanium is shaped in workshops around the globe, the laser work to create the temple motifs has the finest attention to detail, the embellishments in wood, horn, diamonds, sterling silver and 22k gold often make Chrome Hearts one of the most expensive and exclusive eyewear collections ever produced. The sunglasses are mounted with Zeiss lenses, giving them a superior optical quality and protection. Not a single detail is left to chance when creating this one-of-a-kind eyewear collection. No wonder each Chrome Hearts frame is like a work of art. If you’ve got an old pair lying around, hang onto them – they are collectors’ items! Bono from U2, Steven Tyler from Aerosmith, Cher, Kendrick Lamar, Kanye West, Slash from Guns ‘n’ Roses and Elton John are just some of celebrities who love this brand’s gothic/rock-inspired pieces. You can’t get more rock ‘n’ roll than this! Looking to buy Chrome Hearts eyewear? We have a select few pieces to choose from at The Eye Scene. Stop by our store to have a look, or give us a call on 9362 9944 for more details.